Update: An AOL spokesperson has since told Computerworld that the company isn't killing Instant Messenger and they will continue to support and evolve the product. AOL has completely done away with their AIM (AOL Instant Messenger) staff in the midst of company-wide layoffs that are expected to include more than 100 employees. The cuts are said to be led by chief financial officer Arthur “Artie” Minson who is in charge of Mobile, AOL AIM, Mail and About.me. The division reportedly brought in close to $50 million per year in revenue for AOL and $25 million after operating expenses. Two employees familiar with the product said AOL plans to only spend $2 to $3 million each year moving forward, netting in a much larger profit in the short term. With the development team ousted, only a small support group remains. Other employees expected to receive pink slips include those working in the hyperlocal news department known as Patch.com. Smaller layoffs are expected to hit other divisions as well, although they will be more scattered. As Gizmodo notes, news of the chat client being discontinued isn’t anything we haven’t expected for some time now. But for those of us who grew up online in the days of AOL, AIM was a key component of the user experience and at one time held the largest share of the market in North America. In this case, AOL was their own worst enemy as the company continually loaded the pioneering chat client with bloatware in an effort to generate more revenue. This, coupled with more compelling options from the competition led many to abandon AIM over the years. AIM now has less than a 1 percent market share, giving way to Windows Live Messenger, Skype and Yahoo! Messenger. 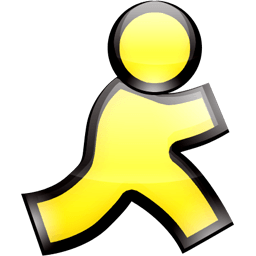 Do any of you still use AIM as your primary chat client?